Muni bonds' tax exemptions make them relatively more valuable to higher-income investors. Because of their tax benefits, muni yields are usually less than yields offered by corporate or Treasury bonds with comparable credit ratings and maturities. Therefore, munis make less sense in a tax-advantaged account-such as a traditional individual retirement account (IRA), Roth IRA, or 401(k) - where earnings are tax-deferred or tax-free. On the other hand, investors in a taxable account may be able to generate higher after-tax yields with municipal bonds if they are in a high tax bracket. The chart below shows the yield curves for a benchmark AAA-rated muni index, the Treasury market, and an index of broad corporate bonds before considering taxes. 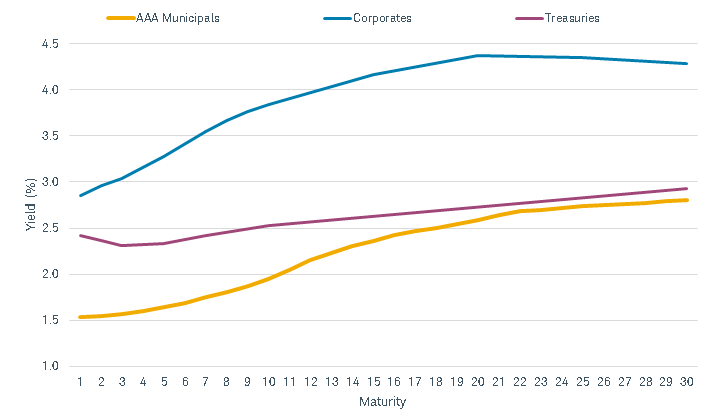 At first glance, corporate bonds have the highest yield, but that's primarily because they're fully taxable and have greater credit risk than municipal bonds. An investor in a high bracket - a 37% federal rate, 10% state income tax rate, and a 3.8% ACA tax rate. These scenarios are the dashed blue and purple lines in the chart below. 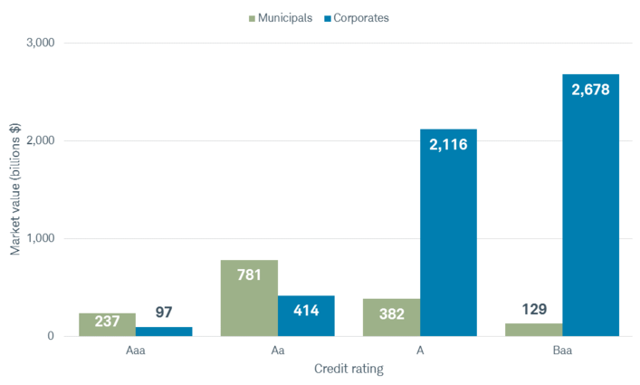 Munis generally have higher and more stable credit ratings. 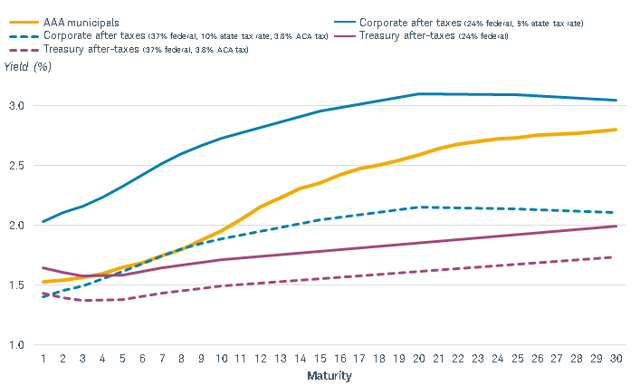 As illustrated above, corporate bonds tend to have higher after-tax yields, but that's partly because the average credit quality of the corporate market is lower than that of the muni market. If you're comfortable taking on greater credit risk, you may be able to achieve higher after-tax yields with corporate bonds. It's worth pointing out that the above yield curve examples used a AAA-rated muni yield curve index and a lower-rated one for corporates. AAA is the highest credit rating. If you're a conservative investor looking for highly rated investments, you may have an easier time doing so with munis. The flip side is also true - if you're looking for higher yields and are comfortable taking on greater credit risk, you may have an easier time finding bonds from different issuers in the corporate market. Source: Moody's Investors Service, as of 7/31/2018. If you're in a 32%-or-above tax bracket, munis probably make the most sense regardless of where on the yield curve you're investing. Consider adding some lower-rated (BBB/Baa or A/A) munis if you're comfortable with added credit risk and are looking for higher yields. However, try to limit exposure to lower-rated munis to 30% of your portfolio. If you're in the 24% tax bracket, consider Treasuries or CDs for the short-term part of your fixed income portfolio, and munis for the longer-term part of your portfolio. Consider adding some corporate bonds if you're comfortable with the added credit risk. If you're in a tax bracket below 24%, CDs and Treasuries probably make the most sense. You could also consider adding some corporate bonds if you're comfortable with higher credit risk. 1 Source: Moody's Investors Service, "US Public Finance: US Municipal Bond Defaults and Recoveries, 1970-2017," July 31, 2018.